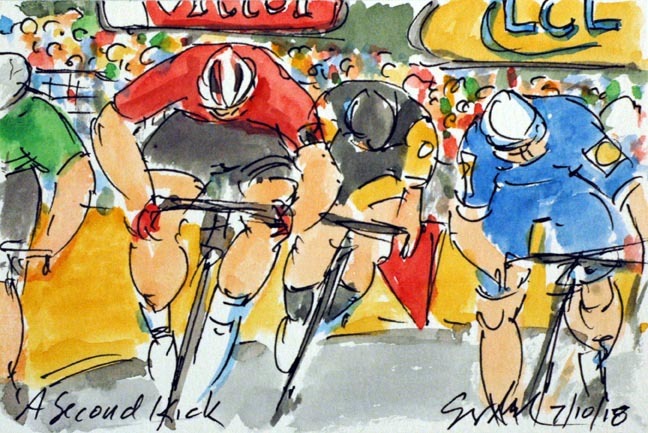 It was Fernando Gaviria's (Quick Step) second kick that got him his second stage victory. However, it was Peter Sagan's second kick that kept him in the Maillot Vert, by virtue of his second place finish. Sagan just managed to get round Andre Greipel (Lotto Soudal) who finished the day in third. Greipel seemed to have the sprint in hand until the two marquee sprinters kicked into turbo. Still managing to be up amongst it was Dylan Groenewegen (Lotto NL Jumbo). Today's stage was the first time the Maillot Jaune stayed put, remaining on the shoulders of Greg Van Avermaet (BMC). In fact all of the leader's jerseys stayed on the shoulders of those who started in them back in La Baule.